An opportunity to better understand spiders, particularly those recorded at Ifton Meadows. Nigel Cane-Honeyset will be telling us about spiders and in particular, about those he found on site during a recent visit. This a public event on Tuesday evening 10th September, starting at 7.30pm, at St Martins Community Centre. Admission is £2.50. Accompanied children are free. 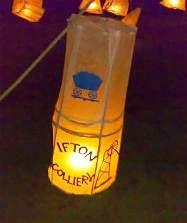 The Lantern Parade is now confirmed for Saturday 2nd November. Free lantern making workshops will be held in the Community Centre before the event. Free workshops will be held at St Martins Centre on Saturday 26th and Wednesday 30th October. Sessions will run between 11am and 5pm . Since lanterns take at least one hour to make, the last start time of the day ids 4pm. All other details will appear here. Please explore Ifton News, Archive and 40 years tabs on the left, for reports and pictures of previous events.